The beach comes to Paris. Live music, mobile libraries, sports events, sandboxes, pools and more will provide visitors with a great beach-resort experience. You'll find everything under the sun going on here, including basketball, tennis, wrestling, fencing, table tennis, bowls, tai chi, ballroom dancing, a gym area, a micro-droplet shower spray to cool you down, an "adventure beach" for young children with water games; and concerts, workshops and shows to entertain all the family. 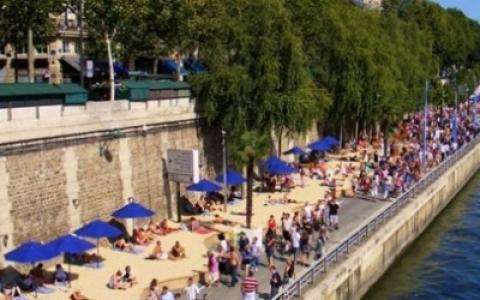 With palm trees, fine sand and plenty of deckchairs, Paris Plage offers that holiday feeling, beside the Seine.